GHANA WOMEN IN BUSINESS AND LEADERSHIP IS THE BUSINESS NETWORK FOR TODAY’S FEMALE ENTREPRENEURS AND BUSINESS LEADER IN GHANA. If you've had your fair share of traditional networking groups, then maybe it is time to try something different! GWIB was formed with a focus on providing a welcoming and friendly environment for business women to meet, network and do business. Using a blend of lifestyle and networking at our events encourages members and guests to break down communication barriers, build friendships and conduct business. Women who own their own business or work for others are equally welcome, bringing different viewpoints and experiences to be shared and enjoyed. Everyone comes for an opportunity to relax,meet up with like-minded women, in a welcoming and informal environment. So, if you fancy networking with a difference, come on in and join. We hold events for you to promote your business build contacts and make friendships. Why not join GWIB network and enjoy the benefits of meeting like minded business women on a regular basis to do business? To empower support and connect sustainable responsible women-owned enterprises through advocacy, funding and capacity building. Anita is the founder of GWIB and the CEO of OML Africa. Anita is passionate about Ghana, its community and supporting other women in their business endeavours and her enthusiasm and energy pervades every activity she embarks on to do with women and business. Anita is supported by a hard working network of women who run their own Ghana based business. The focus of GWIB is its members and their business activities and as a new network GWIB prides itself on being welcoming, supportive, relaxed and fun. Anita believes that as women we should unite, talk and do business together with like-minded people. 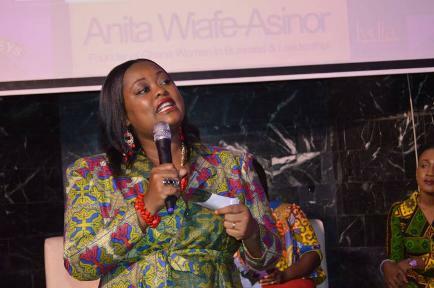 Anita also believes that "women remain an untapped economic potential in Africa. By empowering women to be entrepreneurial helps reduce poverty for women, their families and their communities and that female development and empowerment is the key to developing successful women owned businesses in Ghana and Africa wide".